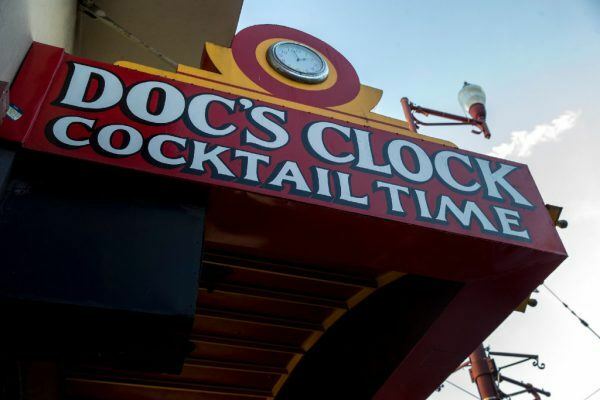 Doc’s Clock was a good place to get out of afternoon’s flare-up, when the sun over Mission Street was blazing toward some painful equipoise between day and night, and hung in a shaft through the transom and the open doors, and lit the linoleum floor tiles there, and lived, for an hour, in the varnish of the near end of the bar, and in a glass of beer halfway down, and in an ashtray in the dark . . .
Down back, someone left the men’s room and came knocking through the tables, past the shuffleboard machine, guy in a white cowboy hat, along the bar, beat-up drunk. He veered into a barstool and spun off toward the street, and stood there in his plaid Western shirt, getting his bearings in the light before choosing a direction and moving on. The bartender, a woman I didn’t know, came out of the dark, took his glass and his empty and wiped the bar. She dropped the bottle in the recycling and asked what she could get me. I was killing an hour after work while my wife packed some things at home. She was moving to her sister’s place while I figured out what I was doing with a woman down in Los Angeles. I sipped my drink, whiskey on the rocks. Nothing moved. Just nothing doing. I lit a cigarette. Sometimes, don’t you wish you could live at the bar, all the way back up in there? That it’d never end, never change. Reached for a napkin. I could never just sit. I started taking notes on my surroundings, just to be doing something. Even apart from my situation the drink made me nervous, as a first drink always did at that hour, as though something were about to happen, as though I were engaging some impossibly greater force, fate for instance, or the spin of the planet, or maybe it was the hour, happy hour, the witching hour, or maybe it was my situation after all. Or maybe it was the napkin made me nervous. A letter to the woman in LA would be a step in that direction. All my troubles had started by writing——by email——the course of four lives changed. I was superstitious about writing. So I described the bar, the sunlight that now dazzled the backbar and lit a patch of the wall, and pretty soon these notes turned into a letter anyway. A couple of bearded kids came in and I put them in the letter. One of them called the bartender Amanda. I’d flipped the napkin over and covered half the other side with writing when a woman in office clothes blew in. She took a stool right near me, across the curve of the bar from me. I put her in the letter. She asked Amanda if there was a payphone she could use to page someone. Amanda said the bar’s phone was a rotary phone but there’s a payphone across the street where she could page someone to the bar. The woman went through her bag. She was in a flurry. One of the bearded guys offered her his cell, and she paged someone to Doc’s. Then she thanked the guy and ordered a vodka with a twist. The woman got her drink and pulled a big red hardcover book from her bag. She flipped pages forward and back like she was trying to find her place. She had her book and the guys had their movies and I had my letter, and we all had our drinks, and we were balanced there, floating on the moments in a nice equilibrium. She asked if there was a Mike. I slipped off my stool and walked down. The woman was coming back. I told her I wouldn’t be long. My wife was calling to say she was leaving now. I talked with her for a minute and walked back to my seat. I looked up. It had just escaped her. I wrote it down. I felt like I was getting ahead of it, even. Writing it to life. She drained her vodka and kept pretending to read her book, or genuinely trying to read it to distract herself. I noted it down. She was visibly upset now, squirming around on her stool, pushing a hand through her hair. She was off her stool by the time I heard the phone ring. Amanda said “Mike?” and held the receiver in the air. I avoided the woman’s eyes as I walked on down. It was the woman in LA. I told her I was leaving soon and I’d call her from home. Back on my perch, I picked up the cigarette I’d left smoking on the bar. The woman across from me was barely keeping it together. Her face would collapse toward tears, and then she’d take a breath. She rubbed her right leg, forcing her concentration on the page. I got another napkin and entered all this into the record. She let out a ragged sigh. She drained the icewater dregs of her drink. Then she clapped her book shut, stuffed it in her bag——and walked out! Just the light of the street in the doorway. The phone rang. I sat up. Of course it would ring the moment she left. It’s like I had a bird’s-eye view of the whole thing: it was all layed out below me, this vista, this whole landscape with them in it, their fate. Amanda gestured with the receiver toward the end of the bar. She stalked past me toward the bar. She was free now to get it off her chest, and she marched along, saved by the bell and calling this guy every name in the book. She was relieved enough to be really angry. I followed her in. It was okay now, for someone, for tonight anyway. Amanda and the two guys were standing at attention. They’d been watching the doorway. There was a whirl beside me——a swoosh, and she was out the door. I ran out there, fumbling with my idiotic apologies as she looked to the left, to the right, and moved off. I watched her go for a minute. Walking into the sun. Then I walked back through the bar and picked up the phone. It was my wife again, calling to tell me one last thing.